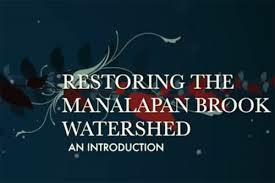 An “Restoring the Manalapan Brook Watershed”, a series of videos produced by the Rutgers Cooperative Extension of Middlesex County, examines restoration efforts within the Manalapan Brook watershed. The Manalapan Brook is part of the Lower Raritan watershed management area (WMA09) in central New Jersey. This video series was developed for New Jersey municipalities, residents, and schools in order to inform New Jersey residents and municipal representatives about local river, stream, and lake restoration practices, help explain ongoing restoration projects within the Manalapan watershed to local residents, and promote the implementation of similar projects in other New Jersey communities. The videos address issues associated with urban watersheds throughout New Jersey, including polluted storm-water runoff, urbanization, and flooding, the videos share examples of how local partners are trying to overcome these problems within Manalapan Brook watershed. This video series is funded by a 319H grant from the New Jersey Department of Environmental Protection. Project partners include Freehold Soil Conservation District, Princeton Hydro, Middlesex County Parks and Recreation, and Middlesex Planning Department, and Rutgers Cooperative Extension of Middlesex County. For more information, contact Michele Bakacs, Rutgers Cooperative Extension of Middlesex County, (732)398-5274 or bakacs@njaes.rutgers.edu.